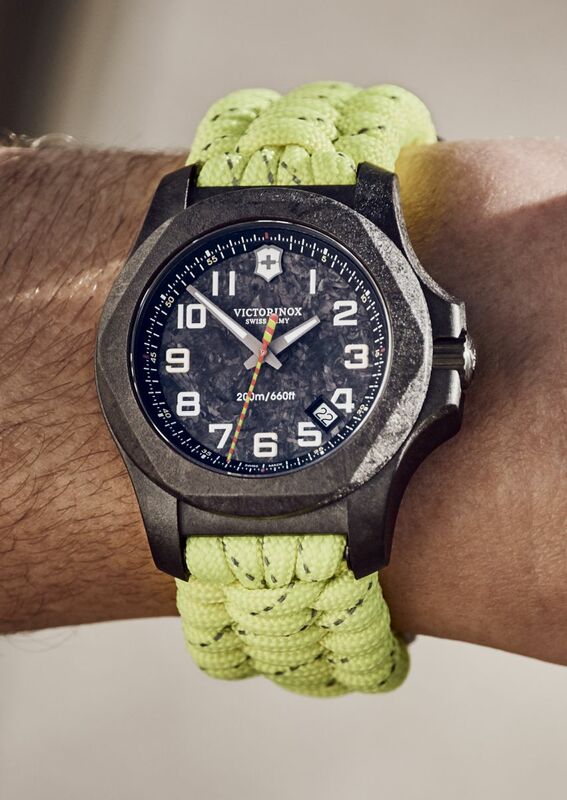 TimeZone : Public Forum » N E W M o d e l - Victorinox Swiss Army I.N.O.X. Carbon L.E. A tribute to firefighters where strength, performance and high-resistance are natural requisites. Inspired by the firefighting universe and its symbolic yellow and red color code, each item is designed for resistance and high visibility. 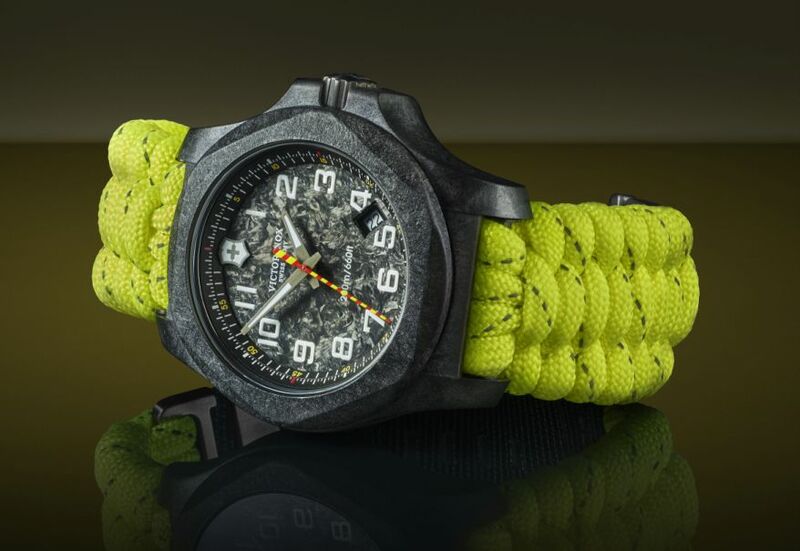 The case, in carbon, measures 43mm. 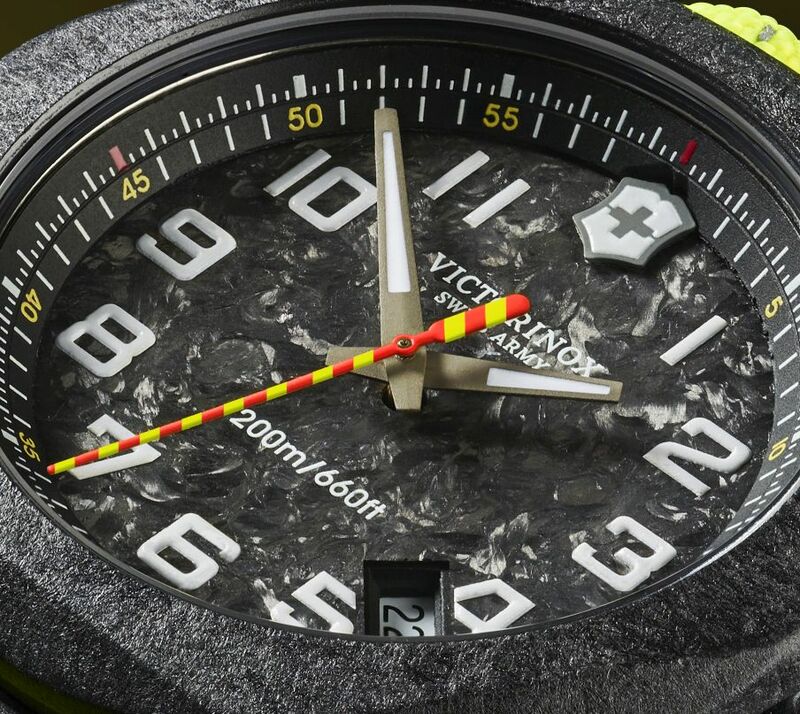 It has an AR-coated sapphire crystal and it is water resistant to 200 meters. Movement is the Swiss quartz Ronda caliber Powertech 715 with 5 jewels, gilded, and with a 60 month battery life. The black dial has SuperLuminova hands, numerals and indeces. Date calendar at 4:30. 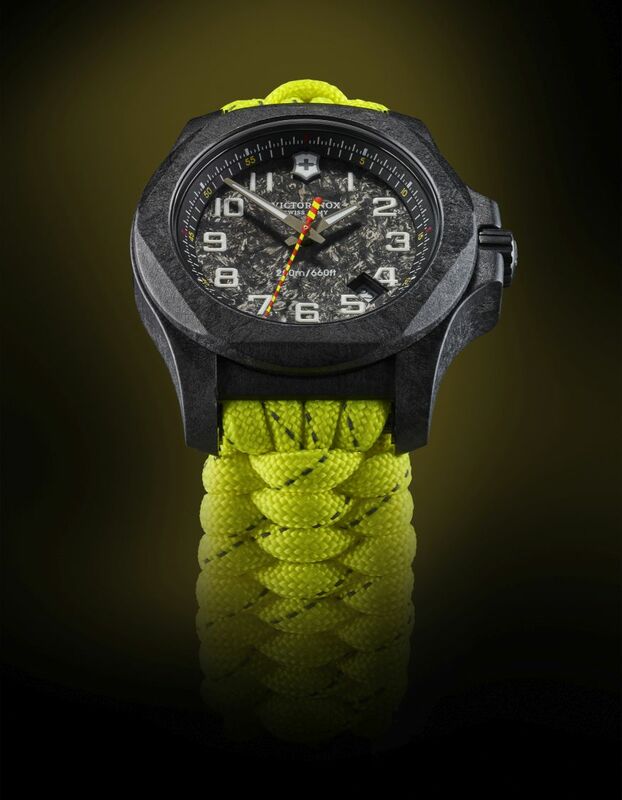 It comes on a neon yellow paracord strap with reflective tracers and with an additional black firefighters boots leather strap. 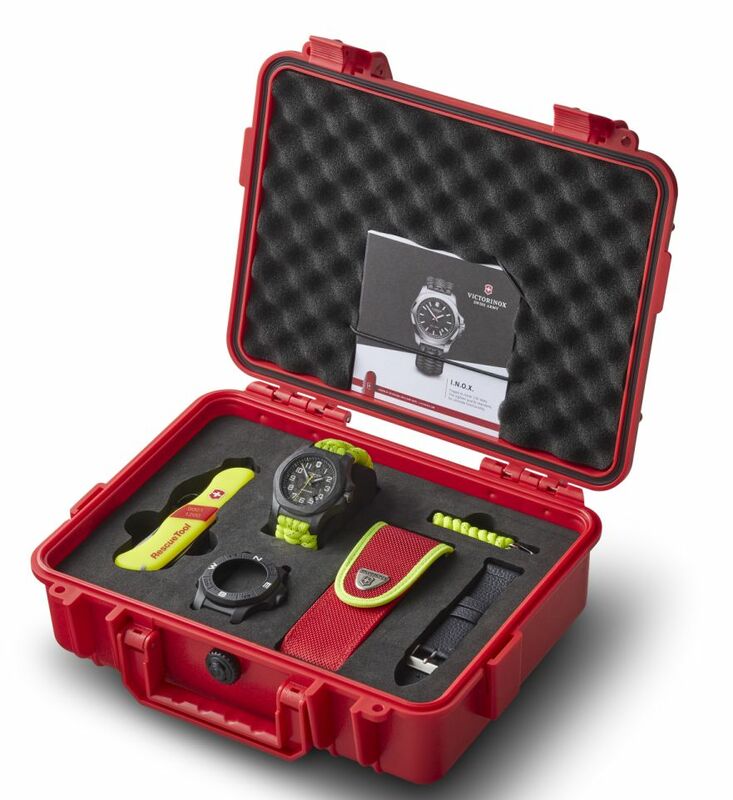 It is delivered in a special shock proof packaging, a Swiss Army Knife Rescue Tool, which can be tucked into its belt pouch, a red Swiss Army Knife strap changing tool, an interchangeable black watch strap, suitably made of firefighter boot leather, and a black bumper. MSRP is 995 Swiss Francs. I'd like to see it on the leather strap. Might make it look better. I admire that they are tying a watch model into an admirable vocation. But it seems they tried very hard to do so, where a strong natural connection simply may not exist. There are a lot of gimmicks and gizmos tossed in to make this appealing. 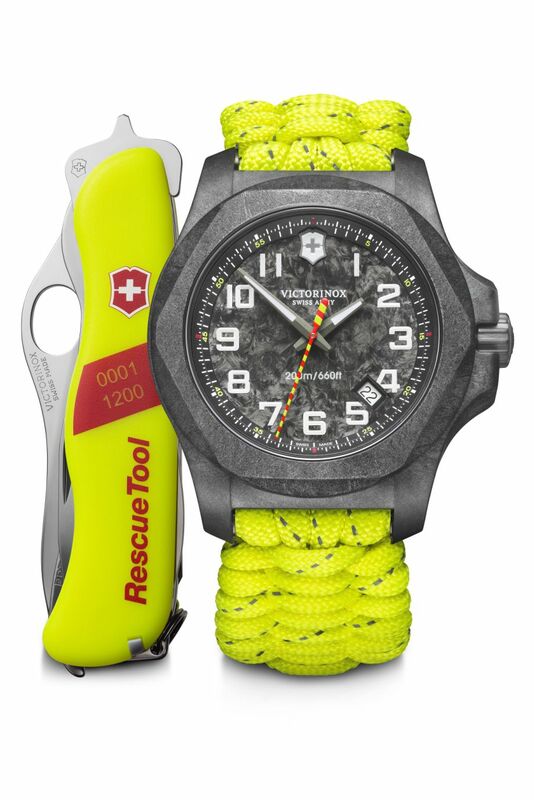 Despite all the extras, it's still $1000 for a quartz Victorinox that really draws attention to itself. but this one doesn't "spark" my interest. Yuck! I had a couple of the quartz models - nice watches. This one is awful looking. 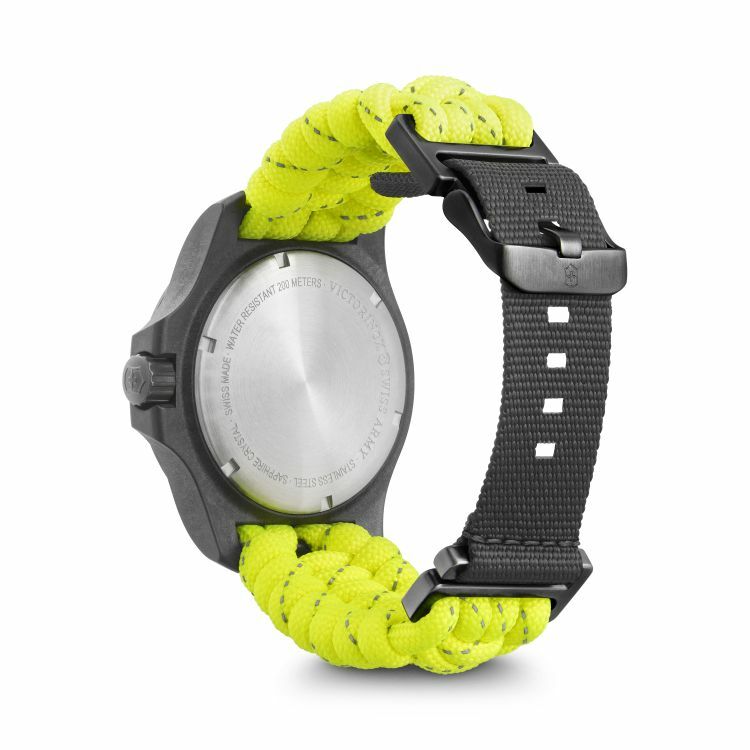 How can a company release such an atrocious looking watch? I truly would not take one for free.